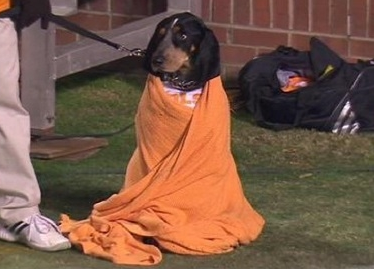 While the weekend brought us some interesting and exciting moments but none may have been as good as the Tennessee mascot, Smokey, wrapped in an orange blanket on the sidelines of their win against Kentucky. Yes, Florida State found a way to win, again! Yes, Melvin Gordon of Wisconsin ran for an NCAA record 408 yards on the ground against Nebraska. Yes, the Green Bay Packers scored 50 plus points for the second straight week. But let’s be honest, nothing beats a hound dog wrapped in a blanket on the sidelines…and the photoshop madness that followed.